Sunday, May 11, 2003... Greetings from Palmdale, California, an hour north of Los Angeles but 25 miles south of the Los Angeles County line. California really needs to subdivide its largest counties; this is as ridiculous as San Bernardino County's extending from the LA suburbs to the Nevada border. The directions from Barstow to Death Valley are simple: I-15 toward Las Vegas, then hang a left at the big thermometer. The World's Largest Thermometer, in fact, rising high above Baker, California. It was only 64 when I passed this morning, but the thermometer registers up to 130 degrees. On a July afternoon, the only sight more depressing than that thermometer would be the signs on the roads leading out of Death Valley, warning motorists that to avoid overheating they should turn off their air conditioners for 20 miles at a time. Almost as depressing: the signs warning that in the 110 miles from Baker to Death Valley's Furnace Creek visitor center, there is one gas station. Death Valley's mineral deposits attracted heavy industry long before the tourists found their way in. The most famous of these industries was borax, which was mined and processed here and shipped out of the Valley in caravans drawn by teams of 20 mules. Several of these wagons are on display in the park, but the best collection of Gold Rush-era ruins lies a few miles across the Nevada line, in the ghost town of Rhyolite. In just 15 years, Rhyolite was born, flourished, withered and died. A 1904 gold strike attracted close to 5,000 residents and the businesses to support them: railroads, banks, schools, newspapers. By 1920 only the buildings remained. 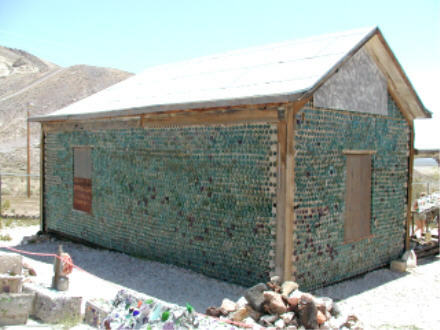 Two landmark buildings, a rail depot and a house built in 1906 from thousands of empty bottles held together with mortar, survive more or less intact; a dozen more remain as recognizable ruins. Local historians have recently added interpretive signs. 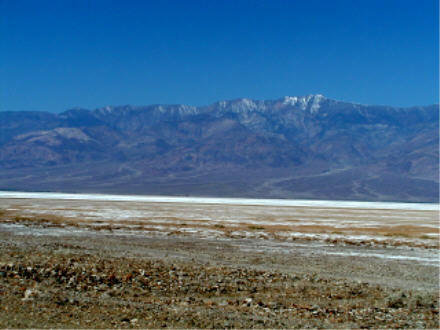 The nearest inhabited town, Beatty, is best known as the gateway to Yucca Mountain, which the federal government and roughly 49 of the 50 states want to turn into a central, permanent repository for nuclear waste. Nevada's elected officials turn purple at the thought. I can't speak to the geological issues, but the site meets other key requirements: it's in the middle of nowhere, and since it's in the Great Basin, any leaks would never reach any metropolitan water supply. Back in Death Valley, I swung north to Ubehebe Crater, formed about 1,000 years ago by a massive volcanic explosion, and Scotty's Castle, formed about 75 years ago by Midwestern executive Albert Johnson, whose doctors told him to seek a drier climate. Johnson spent well over $1 million constructing a sprawling estate near one of the park's natural springs. He befriended a local character, a prospector known as "Death Valley Scotty" who began telling people that he had built the castle. Johnson went along with the joke, even allowing Scotty to continue occupying the house after his own death. Then came the long drive back toward civilization, or at least Los Angeles. The most bizarre sight on the trip south: dozens of commercial jets, many still painted with airline colors, parked in long rows at the Mojave Airport. Tomorrow morning I drive another 40 miles south to meet up with old US 99, then follow 99 or its modern counterparts north through Bakersfield before detouring again for Sequoia and Kings Canyon National Parks. Later!